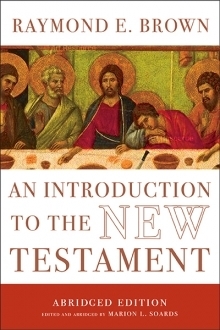 Since its publication in 1997, Raymond Brown’s Introduction to the New Testament has been widely embraced by modern readers seeking to understand the Christian Bible. Acknowledged as a paragon of New Testament studies in his lifetime, Brown was a gifted communicator who wrote with ease and clarity. Abridged by Marion Soards, who worked with Brown on the original text, this new, concise version maintains the essence and centrist interpretation of the original without tampering with Brown’s perspective, insights, or conclusions. The biblical writings themselves remain the focus, but there are also chapters dealing with the nature, origin, and interpretation of the New Testament texts, as well as chapters concerning the political, social, religious, and philosophical world of antiquity. Furthermore, augmenting Brown’s commentary on the New Testament itself are topics such as the Gospels’ relationship to one another; the form and function of ancient letters; Paul’s thought and life, along with his motivation, legacy, and theology; a reflection on the historical Jesus; and a survey of relevant Jewish and Christian writings. This comprehensive, reliable, and authoritative guidebook is now more accessible for novices, general readers, Bible study groups, ministers, scholars, and students alike. Raymond E. Brown (1928–1998) was a distinguished professor of biblical studies at Union Theological Seminary in New York City. Marion L. Soards is professor of New Testament studies at the Louisville Presbyterian Theological Seminary in Kentucky.